I Got My “Game” Face On! I am no stranger to cooking African food; I actually love to cook it! The spices and fresh herbs combine to make any household smell like a restaurant. Lately I’ve been on a wild game kick as you’ve seen in my last post. But before I took that trip to Fossil Farms, a childhood friend of mine who goes hunting every season, gave me some of the deer he bagged on a trip (shout out to George Perkins). Venison is a meat that is mild tasting and similar to elk but less “gamey”. I have made venison in various ways because he gives me so many different cuts to be versatile with. For tonight’s dish we will use some ground venison which is much leaner than ground beef. 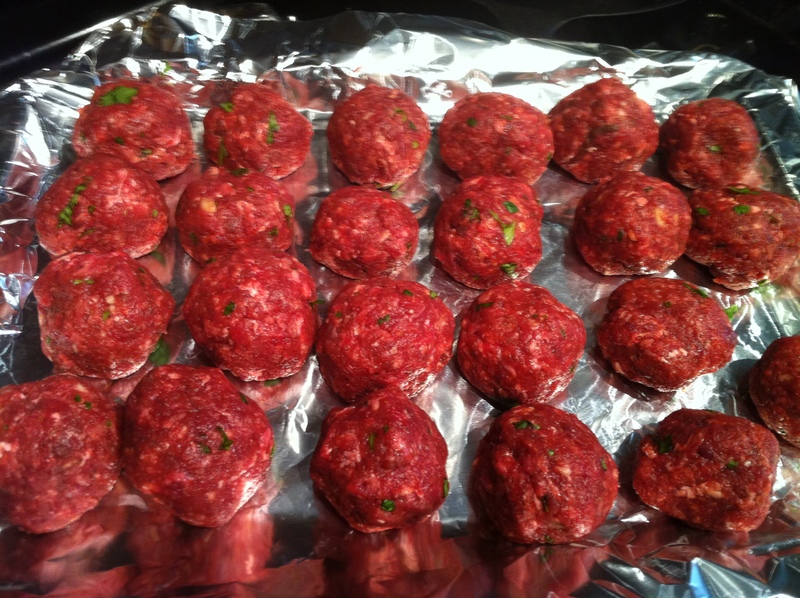 Venison meatballs are ready to go! You might want to add venison to your diet if you are a meat eater because not only is it delicious, it is also a healthier alternative to the meats we normally eat. I did my research and found that venison, elk, and buffalo were probably the first red meats eaten by man/woman (after mastodons).Venison is not only low in fat and cholesterol, but high in vital nutrients like B vitamins, iron, and phosphorus. Venison is resistant to disease and does not live on a diet of antibiotics and steroids. Deer are indigenous to North and South America, Europe, Asia, and North Africa, which is the inspiration for tonight’s dish. 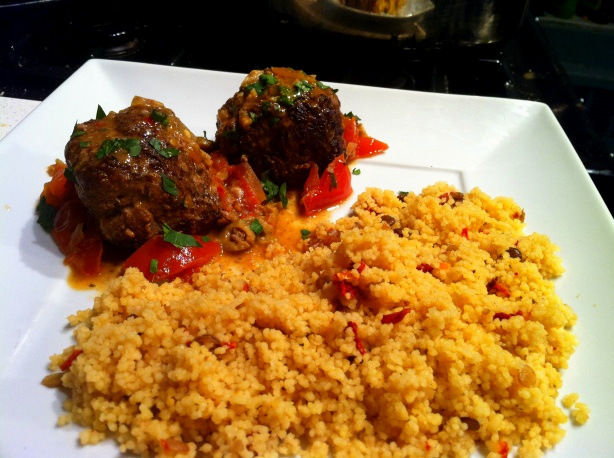 Now I love African food because of the bold, flavorful spices and herbs that are common to the cuisine. The spices used in North African food resemble ingredients used in a variety of dishes from India and southeast Asia. Spices such as cumin, coriander, tumeric, and fresh herbs such as cilantro and ginger are used in most dishes. Some people I know steer clear of African food because they say it’s too spicy, but when you cook at home you can “tweak” it, and spice it to your taste. I like my African food with a kick (lol) so I go full speed ahead with the spices! 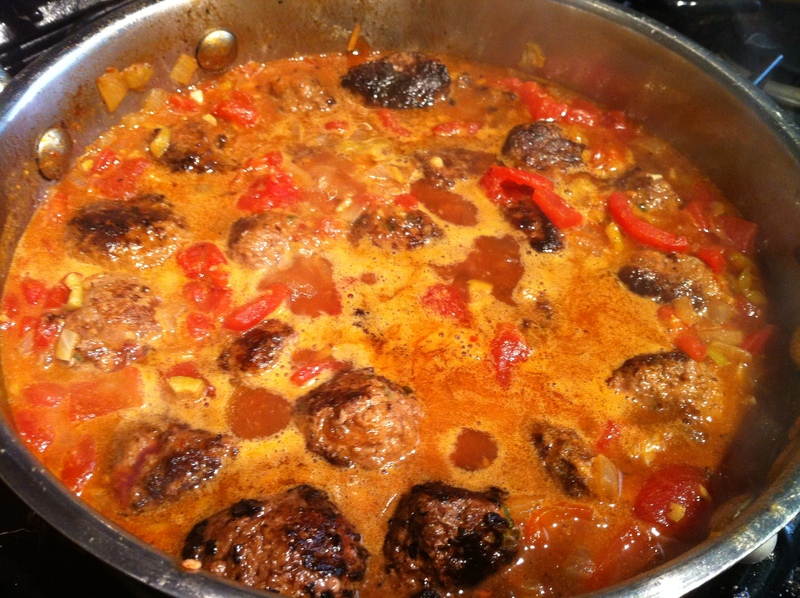 I decided to cook North African meatballs since i love venison and meatballs, I have cooked venison steaks and tenderloins before, but never ground venison. Cant you just smell this food? Posted on September 14, 2011, in Wild Game. Bookmark the permalink. 6 Comments. I would love to be a taste test ! That looks amazingly delicious. I would love to experience the spice flavors. Hey thanks Ruby, Very good dish here! I love African food.